You can find this section under Interface Translations > Models in the IRP Admin left navigation menu. Model translations translate the model description that is visible on the model page into alternative languages. The translated model description will be visible when the user changes their language settings on the front end of the site. You can translate model descriptions on an individual basis or in bulk using the Data Imports/Exports section. Use the search bar to find any model translations. If you expand Other Options under the search bar you can filter by Language or by any models that are missing a translation in a particular language. ID: This is the unique IRP identifier of the model translation. Model: This is the Model associated with the translation. English Description: This shows the English version of the model translation. Foreign Translations: This is where you can add model translations in other languages. As with many other pages in IRP Admin, you can click the Download icon between the Search bar and the main grid to export the model translations in a format of your choosing. Go to Interface Translations > Models in the IRP Admin left navigation menu. Search for the Model you want to add the translation for by entering the Model ID or Model name into the search bar and click the Search button. When the content is complete click to apply it to the site. You can update these translations in bulk by using the Bulk Updates section under Data Imports / Exports. 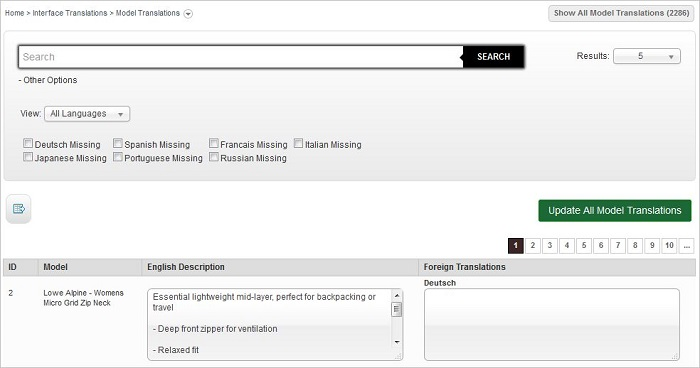 Translate Model page information into multiple languages.